Domo Baal is delighted to present Sharon Kivland's third solo exhibition in the gallery. In 'Reproductions II' Sharon Kivland exhibits new works from the collection, echoing her last exhibition, with a little deviation. 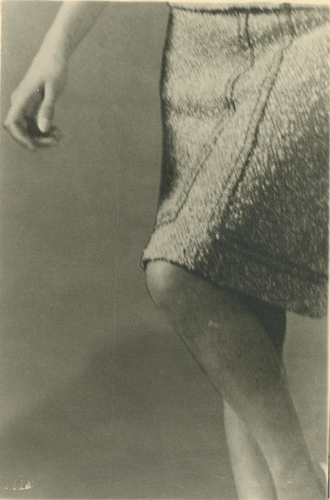 Works include postcards of Rome turned into clumsy negatives; more carefully done drawings of underwear, copied from magazines of the 1950s, immobile and fixed, removed from any supporting body; photographs of belts or waists, bodies or fashion accessories (so difficult to tell sometimes); a knee–length skirt, which appears both constraining and oddly liberating; truncated bodies in attractive trousers and defining belts or in lovely dresses (day and one evening); postcards of stars of the cinema, already fading, embellished (the painted addition may be all that remains); another Nana, ghostwritten this time, describing herself through the words of others. It is, one might say, a matter of structure, as well as one of meticulous cataloguing or insistent representation. Material that has had a life already is reorganised, yet the re–ordering leads to a certain disorder, a somewhat paradoxical economy. It may be rather hard to distinguish perversity from perversion, for example, in certain works (re)presented here, wherein there is both malice and jouissance. This exhibition is accompanied by two essays written for Sharon Kivland's new body of work, by Jan Campbell and Steve Pile. These will be published in a two volume edition of 100 to be bound together and will be available from the gallery. Dr. Jan Campbell is a Reader in English Literature and Psychoanalysis in the Department of English at the University of Birmingham. She was also a member of the Cultural Studies Department at Birmingham until its abrupt closure in 2002. Jan Campbell has also worked clinically for thirteen years as a psychoanalyst, as well as writing widely on psychoanalysis in relation to feminism, queer theory, autobiography, social and cultural theory, literature, and film. Her most recent book is on the telepathic movement of a maternal form, which she argues is the necessary transferential sublimation of the repressed 'Freudian Passions: Psychoanalysis, Form and Literature' is forthcoming from Karnac in the Spring of 2013. Professor Steve Pile teaches Geography in the Faculty of Social Sciences at The Open University. He has published on issues concerning place and the politics of identity. He is author of 'Real Cities: modernity, space and the phantasmagorias of city life' (2005) and 'The Body and The City: psychoanalysis, subjectivity and space' (1996). His many collaborative projects include the forthcoming collection, 'Psychoanalytic Geographies' (edited with Paul Kingsbury). He is currently working on early Freudian psychoanalysis and geographies of the body. Sharon Kivland's work is included in 'Invitation à l'imaginaire' at L'Imagerie, Lannion, Brittany, France 19 January to 23 March 2013 and also 'Ulysse(s) L'autre mer' curated by Marcel Dinahet, Jean–Marc Huitorel, Catherine Elkar: part of a year–long celebration of exhibitions and events to celbrate 30 years of the F.R.A.C. collections from 17 May to 25 August 2013. Forthcoming solo exhibitions include Galerie Bugdahn und Kaimer, Düsseldorf, Germany in June 2013 and Cafe Gallery Projects, Bermondsey, London in 2014.